These analyses act as a report card, and should be used to score your company against the competition. Before starting your analysis, I recommend creating a Google Spreadsheet to keep you organized. Plus, you can easily collaborate with your team, to divide, and conquer. But where you do you begin? The thought of a competitive analysis can often be daunting, especially in the digital sphere, so I’ve put together a list of a few metrics that help weed through the challenging data tundra. First up, and one of the more straight forward metrics to use in your comparison, is Domain Authority (DA). DA is a metric developed by Moz, that utilizes machine learning, algorithms, and a number of link metrics. Domain Authority scores range anywhere from 1-100, with 100 being the best. This metric predicts how well a site, and its pages, will rank on Search Engine Result Pages (SERP). Use Moz’s Open Site Explorer to pull comparative link, and domain authority data (see below). Many SEOs speculate (and I agree) that the best way to influence overall DA is to earn quality links, from sites with a high DA. These links act as signals for search engines, and can help infer how authoritative your site is. Backlinks are any links that are coming from a web page into your site. In the past, SEO has gotten a bad rap, as sites were rewarded for the number of links they had, as opposed to the quality of those links. Because of this, many sites employed black hat techniques, like buying links. Luckily, as search algorithms have advanced, the emphasis on quality over quantity, and the tactics used to earn these links have evolved. 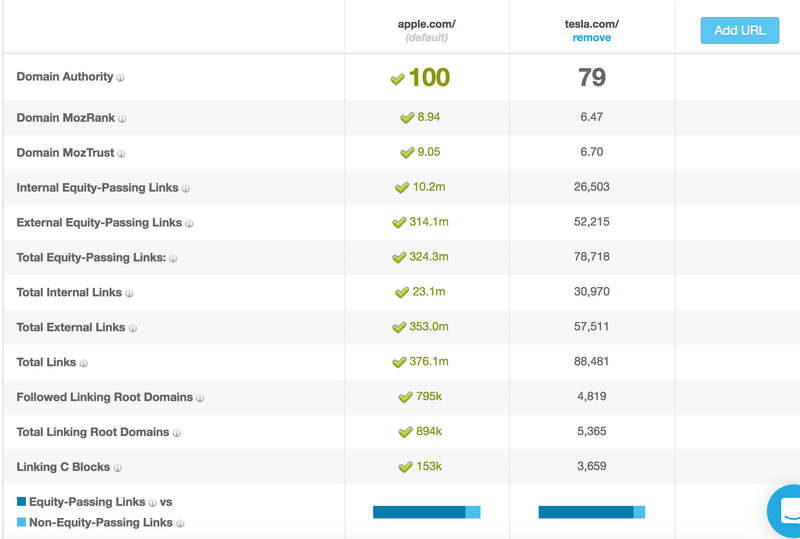 I recommend using SEMRush’s analyzer, and BuzzSumo to evaluate your competitors backlink profile. Once you’ve pulled the backlink profile for each, it’s time to analyze. Pay attention to the number of links, and also what type of links. Are the links from paid opportunities? forums? resources? spam? third party articles? Are they from press releases? Not all links are created equal. By analyzing the profile, you can identify opportunities for your site, as well as pinpoint weaknesses/strength in your competitors. Knowing how many, and which keywords a competitor is ranking for, allows you to analyze their marketing efforts, and identify opportunities you can seize upon. Before starting this, I recommend putting in the time to determine your own target keywords. I use a combination of SEMRush, Google Keyword Planner, Search Console, and Moz to do my keyword research. Once you know you’ve identified your company’s priority keywords, you can then analyze where your competitors stand in correlation to your efforts, and potential opportunities. I like to use SEMRush’s domain vs. domain capability to compare sites (up to 5 domains), and see which sites are competing for keywords the most, as well as visualize where the overlap is. While this next step is pretty subjective, it should not be overlooked. When looking at content marketing I tend to look at what kind, and how many assets/resources they have as well as their quality, and frequency of creation. I tend to focus on blog posts, white papers, videos, and webinars. This helps inform as to what level of effort a company is putting into their digital marketing, and where they are focusing their time. Along with content marketing, I also take a deep dive into social media profiles. I look at the number of, and quality of followers, their social media strategy, which platforms they are on, the level of activity, and their best performing content on social media. BuzzSumo is one of my favorite tools to use, it shows what content is performing best on each platform, what times of day/day of week work the best, and more. The site crawl will also pull HTML titles, meta descriptions, redirects. In addition to these metrics, take a look at the site their image alt text, schema markup, cross-linking, anchor text, site/page speed, and sitemap. The site crawl will give you a high-level view of the current state of their site, and see where your site measures up. The metrics above, should give you a good holistic view of your competitors, where you stand, and what needs to be done to compete. The competitive analysis should inspire, inform, and educate new opportunities for your site. Interested in a competitive analysis? Contact me!